The Sacramento River and its tributaries (the Feather, Yuba, and American Rivers), together comprising the "Four Rivers Index", represent the primary input into the California State Water Project, operated by the California Department of Water Resources (CDWR). 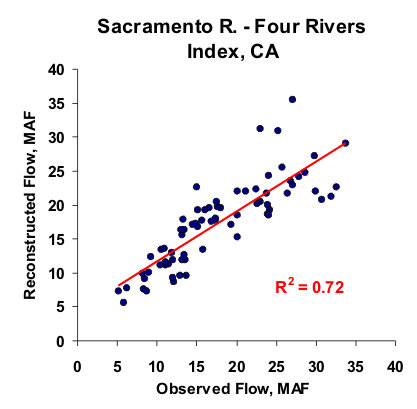 In 1999-2001, David Meko (University of Arizona Laboratory of Tree-Ring Research) developed a reconstruction of the Sacramento River, Four Rivers Index (901-1977), for the CDWR. This reconstruction was an update to one Meko had developed for the Four Rivers Index a few years earlier, that spanned a slightly longer period (869-1977) but had poorer spatial coverage of predictor chronologies in the early portion. The updated reconstruction shown here is presumed to be more robust. See the header in the data text file archived at NOAA WDC-Paleo for more information on the differences between the two reconstructions of the Four Rivers Index. Meko also developed a reconstruction of the Feather River inflow to Oroville Reservoir as part of this work. Meko, D. M. 2001. Reconstructed Sacramento River System Runoff From Tree Rings. Report prepared for the California Department of Water Resources, July 2001. The Sacramento reconstruction uses a time-varying subsets methodology to optimize the use of tree-ring data available for each time period. A set of 42 tree-ring chronologies from California, Nevada, and Oregon comprised the underlying dataset for the reconstruction modeling. Because the observed flow record for the Four Rivers Index is skewed towards high flows, and so the relationship between the observed flow record and the tree-ring chronologies tended to be logarithmic rather than linear, the observed record was transformed into log 10 units prior to calibration. Three different sub-period models were calibrated by regressing the log-transformed observed flows against principal components (modes of variability) derived from the tree-ring chronologies which spanned those sub-periods. Sub-period model 1 (901-1299) used PCs derived from 7 chronologies, sub-period model 2 (1300-1607) used PCs derived from 13 chronologies, and sub-period model 3 (1608-1977) used PCs derived from 28 chronologies. Figure 1. Scatter plot of observed and reconstructed Sacramento River annual flow, 1906-1977. Figure 2. Observed (black) and reconstructed (blue) annual Sacramento River annual flow, 1906-1977. The observed mean is illustrated by the dashed line. Figure 3. Reconstructed annual flow for the Sacramento River flow (901-1977) is shown in blue. Observed flow is shown in gray and the long-term reconstructed mean is shown by the dashed line. Figure 4. The 10-year running mean (plotted on final year) of reconstructed Sacramento River flow, 901-1977. Reconstructed values are shown in blue and observed values are shown in gray. The long-term reconstructed mean is shown by the dashed line.